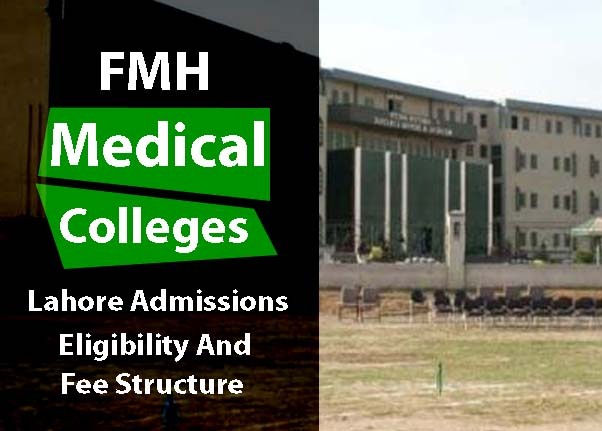 FMH College of medicine and dentistry Lahore is one of the best and most reputable institute of the province and the country. It was established in the dawn of millennium in 2000 and it is about to known as Fatima Memorial Hospital System. It is a recognized institute and affiliated with the UHS which is University of Health and Sciences. They believe in their faculty and they have a mission to make the future of their student bright. There students have achieved almost 40 positions and almost 500 in UHS examination system. They are also attached with Institute of Allied Health Sciences. FMHCMD is light for bright future, that not only graduate the students with complete knowledge of health cares but they also make their professionals eligible to compete with the world class doctors because they have world class faculty and they have complete trust on them and they put their efforts to make the student eligible for that. As we all know that it’s a research center and the college provides all the facilities to the students that they utilize to think about the critical things and faculty tries to develop the mind building of students. They made the students to think and work on the Global advancement in knowledge. Fatima memorial hospital has the thirty four (34) years old teaching campus for the training of students and it is located in the campus. College faculty is trying to improve the knowledge by giving them lectures and involving them in extra co-curriculum activities too. They follow the pattern of PMDC and UHS. This college is making moves in its results and every year their merit is going high because of their best results in medical sciences. It is also the part of International Medical Education Directory (IMED). You can check the name of FMHCMD at www.imed.ecfmg.org. Admissions of MBBS and BDS are open now for 2016 session at FMHCMD college and those students who want to be the part of this college can apply now as the date of form submission is 7 November 2016 as this will be the last date for the submission of application form. And the form that are received after the due date will not be considers so send your document if you are using TCS before two weeks of the deadline date. This is what you are looking for, for your bright future. Student with the back ground of pre-medical with at least 60%. Only candidates who have 60% can apply for admission in MBBS and BDS. All the candidates require to appear in the test of UHS and then the selection will be based on the result of UHS and overall aggregate of students and the merit of last year. The candidates who are appearing from foreign countries, they need to appear and pass the tes of SAT 2. The prospectus is available at campus of FMH and it charge 1500 per student. If you can’t come then you can order the prospectus in 2000 pkr. You can submit your form at FMHCMD campus or you can send the courier with the bank draft of 2000. If you are applying for one field then it charge 2000 and if applying for both MBBS and BDS then you need to submit 2500 pkr. The merit this year has raised because of the number of students applying for medical sciences and because of aggregate of students. Admission fee that you only need to submit at the time of admission only is 50000 and UHS charges + 5% of advance WH tax. The total amount you need to submit as admission fee and annual tuition fee is 766,560. The fee for UHS examination is 5000. The main issue that is faced by the students is the problem of residence. FMH provides hostels facility separate for males and females. There will be a warden and security guard 24/7. The students who don’t belongs to Lahore are given preference. This college is located at shadman, Lahore. There are number of colleges and universities in Lahore and many people make decisions to settle in Lahore because of job and business opportunities and well managed education system. This college provide transport facility to the students. Both males and females. There are parking area where students can park their own vehicles by reporting in registration office. For the students to learn practically from their medical sciences study there are hospitals in the campus and these are Fatima Memorial Hospita, Ijaz Hospital and KhairunNisa Hospital.